Évora Cathedral is located right in the heart of the Old Town, close to many of the city’s most famous ecclesiastical buildings. Known in Portugal as the Sé Catedral de Évora, it is an attractive mix of Romanesque and Gothic architecture and its ancient sections date from AD1200. 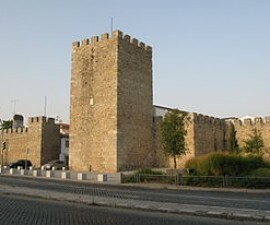 It is one of the most visited monuments in the city, making part of the area of Évora that has been designated a UNESCO World Heritage site for its architectural and historical significance. The imposing façade faces out onto the main square and overlooks the city spires and rooftops, located as it is at the highest point in Évora. 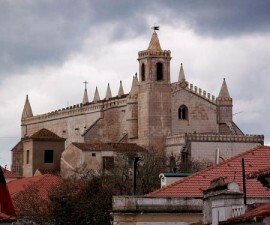 It is constructed mainly in rose granite and is reminiscent of Lisbon Cathedral, with its two huge towers (added in the sixteenth century) and entrance gallery. The original gothic features include a huge window with a period tracery that provides most of the light to the interior. The two towers boast different spires and decoration and are both equally attractive in their own right. Évora Cathedral’s main portal is a beautiful example of Portugal’s gothic sculpture tradition and the attractive marble columns are decorated with enormous statues of the Apostles. 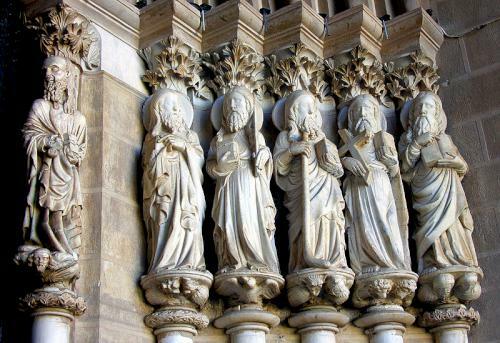 The design is similar to that of Notre Dame and Chartres Cathedrals in France and it is without doubt the most impressive example of its kind in Portugal. 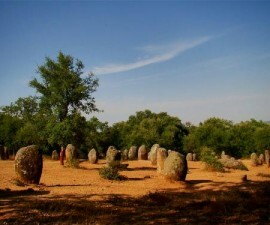 Historians believe these date back to the mid-fourteenth century and were possibly sculpted by renowned sculptors of the time, Mestre Pero and Telo Garcia. 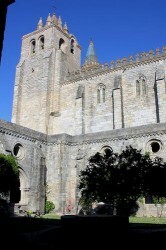 Évora Cathedral is equally impressive inside as it is out. The interior is formed into a nave with two aisles, with a centrepiece of an eighteenth-century altar that is a study in period opulence, in pink, black and white marble. 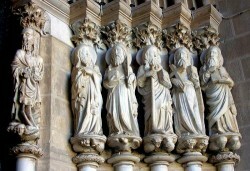 This section was created by the German architect Friedrich Ludwig, as was the choir. The fifteenth-century sculpture of a pregnant Virgin Mary is unusual for its obvious display of her swollen stomach and is something of a pilgrimage site for young women from the local area who come here to pray for their fertility, or for partners and family members of pregnant women to pray for an easy labour and childbirth. The Gothic cloister leads to an open terrace and some lovely views out over the surrounding Alentejo countryside. 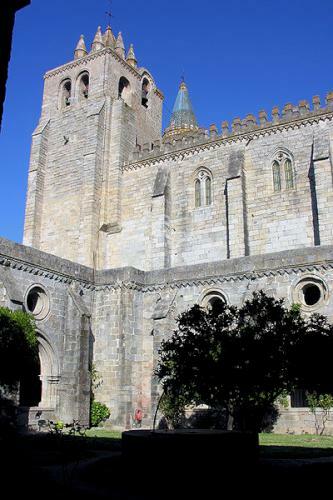 The Sé Catedral de Évora houses the Museum of Sacred Art in its south tower with some interesting pieces of religious art and over a thousand precious stones.